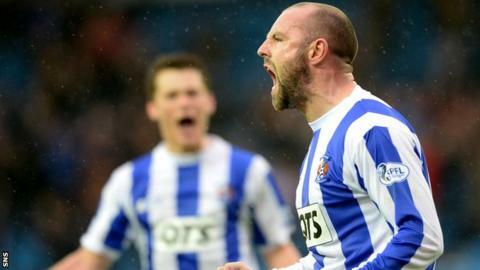 Kilmarnock manager Allan Johnston vowed to play for the win when Kilmarnock go head-to-head with Hibernian. The Rugby Park side boosted their hopes of avoiding the relegation play-off with a 1-0 win over St Mirren. They need just a point to condemn Hibs to the play-offs, but Johnston said they won't leave anything to chance. "It's in our hands again," Johnston told BBC Radio Scotland. "We've got to go win the game. We've got to get the points we need." Kris Boyd's 21st-minute goal was the difference between the two sides as the home side bounced back from the weekend 5-0 defeat by Hearts. "That was the kind of reaction we were looking for," said the Kilmarnock manager. "You could see the fans got right behind the players as well and it makes a massive difference - and the boys were fighting to the very last whistle there. "You could see the passion, the desire and that was lacking in the Hearts game. You could see how much it meant to the players - how much it hurt them. "Rory McKenzie was fantastic. He caused all sorts of problems with his movement running behind defenders, he did really well. It was a really good team performance. "I think it'd have been really harsh if we never got three points." It was the Ayrshire men's first win in five games and leapfrogged them above Hibs, but Partick Thistle's win over Hearts means who will finish second bottom will be settled in the Easter Road showdown on Saturday. They will have to do without James Fowler, who was sent off after a second yellow card three minutes from time. "It was an excellent performance, but we know we've got another massive game coming up in a couple of games," added Johnston. "We've got to make sure we recover well and we're ready and fighting for the next one. "The only disappointing thing is James Fowler's going to be missing. I don't think it was a sending off myself. I thought he did fantastic coming in there. "He's not played for a couple of games so he done really well."